I love fingerling potatoes, but I don't like boiling them in water before cooking in olive oil, as most recipes direct. So I came up with this easy method that reverses this step; the potatoes are first fried, then water is added to the skillet and they steam, covered, until tender. Be careful when adding the liquid to the hot pan with the oil; that's the only drawback of this method. Any time you add liquid to oil, there will be spattering. Stand well back and protect your hands with hot pads. 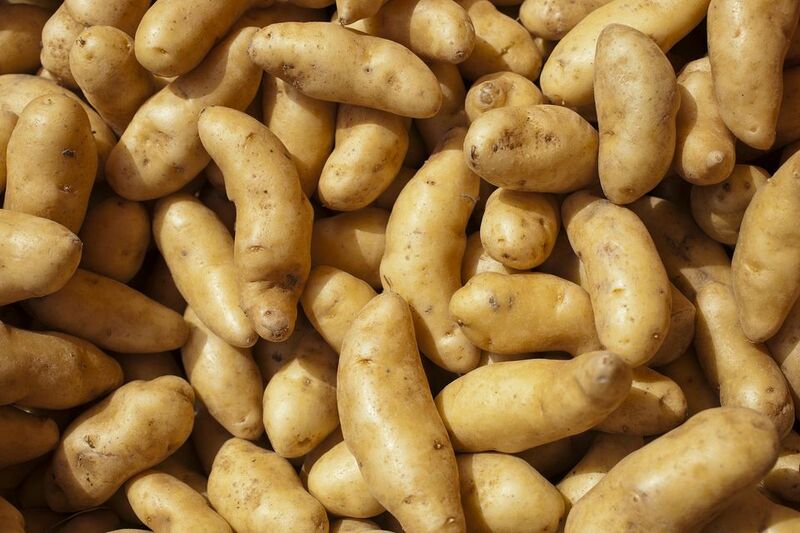 Fingerling potatoes are a fairly new type of potato; they are small potatoes but are slender and shaped like fingers. You can buy them in many colors, from white to brown to red to purple to yellow. Choose the ones you like best for this simple recipe. These fingerling potatoes are creamy on the inside and crisp and tender on the outside when cooked properly, and are the perfect accompaniment to any meat, such as grilled steak or chicken, meatloaf, or a pot roast. Place the olive oil in a large heavy skillet with a lid and heat over medium heat. Add the potatoes and saute over medium heat, turning frequently with a spatula, until they are golden brown on the cut sides, about 5-7 minutes. Now carefully, and being sure to stand well back, add the water. The pan will sizzle furiously. Return the pan with the potatoes to medium-high heat and bring to a simmer. Reduce heat to medium-low, season with salt and pepper, and cover the potatoes. Simmer for 5-8 minutes until potatoes are tender and creamy.